Complementing my daily blog interviews, today’s Author Spotlight, the eighty-fifth, is of mystery / thriller author Marietta Miemietz. Marietta Miemietz was born in Germany. 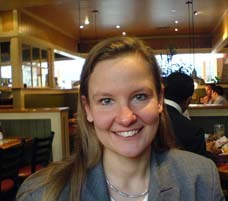 She has spent 15 years working in the financial services industry, mainly as a pharmaceutical equity research analyst, in the US, Germany and most recently, the UK. She has wanted to be a writer since she learned to read and write and always carries a notebook to capture funny or bizarre anecdotes. She likes to write books that are entertaining, upbeat, humorous, packed with suspense and unexpected developments and that have a happy ending. Portraying interesting and endearing characters is her first priority. During her many years in investment banking, she has met many talented and entrepreneurial people, as well as some annoying and crazy specimens. One day, she took a walk and thought about how much more exciting it would be if one of the latter was a dangerous psychopath; the idea for her first thriller “Off-site” was born. The protagonist, Aline, has some auto-biographical features; all of the other characters, events and places are purely fictitious, but never far-fetched. 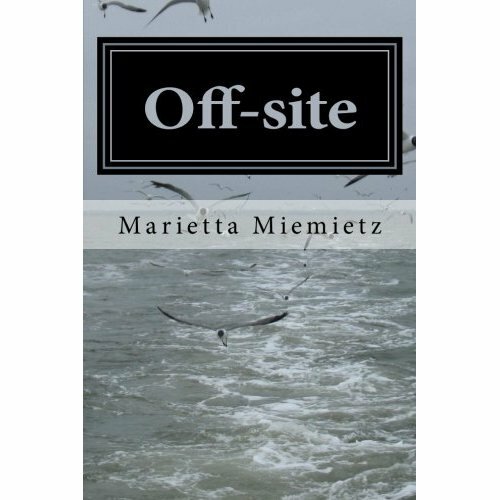 Marietta speaks several languages and is working on the German and French translations for “Off-site”, as well as a new thriller. More than thirty years elapsed between the day I decided to become a writer and the day my first book was published. The reason was not that I produced a tome that required decades of research. Nor can I put the blame on finicky publishers, having decided to self-publish from the outset. The reason for the long delay is far more trivial: I got caught in the rutz. As a child, I was deadly serious about authorship. As soon as I learnt to read and started devouring children’s books, I decided to write books as well. But I was up against a seemingly insurmountable obstacle: the books I read were written in neat print, and I felt that my spidery handwriting didn’t measure up. I asked my parents for advice, and they gave me a broken old typewriter. I was over the moon with my new toy and spent hours on end typing the first clumsy paragraphs. I asked my Mom whether she thought that Astrid Lindgren had started out like that, and when she replied “possibly”, that was all the encouragement I needed. Throughout my childhood and adolescence, I started many books that I never finished. When I went off to university to study business, writing took a backseat. I partially realized my writing dream in the context of my job: as an equity research analyst, I cranked out hundreds of pages of non-fiction work about pharmaceutical companies each year. But I always held on to my dream of writing fiction one day. Everywhere I went I carried a notebook to capture hilarious, bizarre or infuriating episodes. Whenever I felt that life was unfair, I took comfort in the thought that it made for brilliant material for my future books. When I left investment-banking in the context of a financial crisis that removed all those aspects of my job that had attracted me to equity research in the first place, I immediately set out to write my debut investment-banking thriller, Off-site. However, I soon put it on the backburner again as I launched into numerous new projects. Then, all of a sudden, my grandmother got very ill and I boarded a plane to a small town in Germany to spend time with her. The only thing that I found easy to do over there was writing. Without her illness (and speedy recovery! ), Off-site might never have seen the light of day. The completion of my first book was the kick-start I needed. I have since translated it into German. I prefer to self-translate whenever possible – that way nothing gets “lost in translation”. I have also started to work on a medical thriller. Writing is simple: all I need is a stretch of several uninterrupted days to immerse myself in the world of my characters. For me, the fascination of writing lies in the chance to create my own world. When I put down my pen, I invariably feel as if I have just come back from a vacation. Thank you, Marietta, I love fiction for just the same reason. 🙂 You can find more about Marietta and her writing via…her author page on Amazon.com, and her book is also available on Amazon.co.uk. The blog interviews will return as normal tomorrow with thriller / suspense novelist Joshua Graham aka fantasy author Ian Alexander – the three hundred and seventy-second of my blog interviews with novelists, poets, short story authors, biographers, agents, publishers and more. A list of interviewees (blogged and scheduled) can be found here. If you like what you read, please do go and investigate further. And I enjoy hearing from readers of my blog; do either leave a comment on the relevant interview (the interviewees love to hear from you too!) and / or email me.